At Portsalon Golf Club one can appreciate the Dongal's Fanad Peninsula and the beaches of Ballymastocker Bay. Trolley hire available. Catering on site. 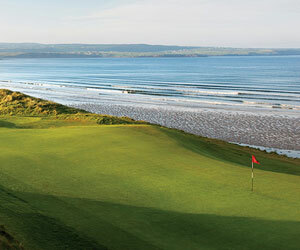 Blessed by nature, the triple golden beaches of Balymastocker Bay lie at one end of this beautiful situated links course. Porsalon is simply the best golf course setting I have ever played. Fringed by mountains and the second most beautiful bay in the world, great guiness at the 19th hole, and a whole host of friendly companions willing to join any single players. I used to play here on a student membership of 40 Euros a year about 5 years ago and try to get back every year. 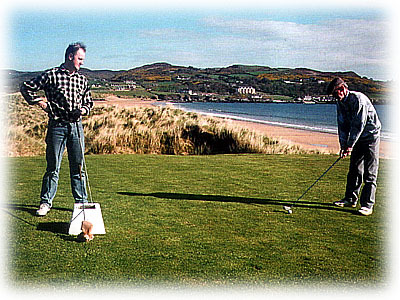 Portsalon is to be considered as one of the most stunning and beautiful places to play golf throughout the whole of ireland.The course itself is well maintained and the holes are both entertaining and challenging.The sheer rural quality of the landscape adds to the course making the holes appear naturally formed. A must play for any Irish golfer. A beautiful links with magnificent views over the sea , the beach and the bay. The ride from Letterkenny to Portssalon is just great. The golfcourse is in transformation , so it was sometimes a little difficult to find the tees between 8th and 12the holes. Some greens were not in a very good condition because it was early in the season. Some places were dangerous because fairways are crossing on 2,3 holes. There are also some nasty blind shots, especially if it is the first time you play the course. But i had a very good golf afternoon ,admiring the panorama and playing good golf. They are working on new holes at the south end of the course alongside the bay, this is always going to be a fantastic course. A place just for connoisseurs. (i am 52,playing 42 years hdcp 1)The course is very difficult in windy, rain conditions, but we are in Ireland. There is also a little restaurant at the pier 200meters from the clubhouse, its open continuously ,i recommend it. I have to agree with Michael L. McGowan. Starts off really well with some outstanding holes with a few average and some other brilliant holes inter-spaced! They are also currently upgrading it to a par 72 with ruddy the designer. Unfortunately this will subtract somewhat from the charm but with the natural scenery and beauty of the place it should be impressive once bedded in. Also the dangerous holes which criss-cross will be eliminated. All told though a cracker of a course. Beautiful area too. Recommend the guesthouse across the road (on bord failte web site). Simply brilliant! This is an incredible course. It is very old-fashioned and unique in this way. There are a few criss-crossing holes, and some blind shots. The first 6 holes are the best first 6 in Ireland. After that, there a handful of great holes and some average ones. On the whole, this is one Ireland's greatest. Eccentric, scenic, old-fashioned and fun. Best 25 euros i spent on a course, I had come over from Bournemouth for an irish weekend and meet up with my irish friends at belfast and we play portsalon, just superb, the 2nd hole is one of many great holes.